Spring cleaning—like Daylight Savings or cockroaches—just won’t die. Why? Because we all love the feeling of a clean house and classroom. It just feels right when the a gloomy cold winter gives way to sunshine and blue skies. However, with the number of tasks every teacher handles throughout the week, it can feel like an impossible task to spring clean a classroom. We eagerly await the day when we can purchase a magical spray to make a dirty room clean. Hey, air freshener sprays come close. And they’re certainly handy in a pinch to cover up the scent of recently-cleaned-up vomit before a parent-teacher meeting—but they’re not a long-term solution. 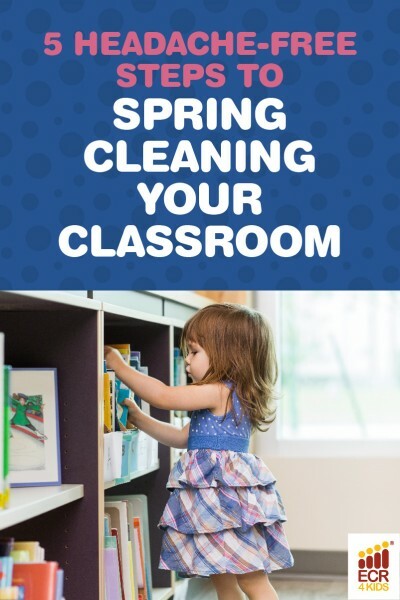 While we wait for the day when that magical “instant clean” spray arrives, there’s a simple way to get your classroom clean this spring. But before you go crazy stocking up on extra cleaning supplies, stop. We’ll show you efficient ways to clear out the clutter and get your classroom squeaky clean the easy way. You might have gotten used to the layers of student artwork on the walls, the bins full of disorganized toys, and the stack of papers on your desk, but your brain probably hasn’t. If you’re feeling overwhelmed and keep losing documents, it’s time for a classroom overhaul. Create a keep, donate, and trash/recycle pile, starting with your desk. It’s a good time to take inventory, too—you might find that you have five staplers and other needless supplies taking up valuable space. Gather extras and share them in the teacher’s lounge for others to take as needed. Make sure you set a time limit on how long the supplies will be there, otherwise you’ll just be spreading your mess elsewhere. If your students don’t take art projects home every day, you might find yourself buried. It’s OK to keep a gallery wall or exhibit work, but make sure you have a time limit, after which you’ll place projects in student cubbies for them to take home. After you’ve cleared out your classroom of extra papers, supplies, and beyond, it’s time to create new organizing systems for problem areas. Write down your problem areas, and know you don’t have to tackle every problem at once. Just choose one every week! Use utensil dividers from the thrift store to organize paintbrushes, etc. For everything else, there’s Pinterest. Search for whatever you need, and you’ll be sure to find a fresh way to tackle a problem area. If you’re trying to do it all on your own, you’re doing it wrong! Kids are great cleaning helpers, and they’ll bring a level of energy and excitement to the table (literally) when you assign “table captains.” Designate one table captain per week, and help them lead their table mates in a short list of daily cleaning activities, such as: wiping down the desk, throwing materials and paper in the recycling, delivering all projects to the correct cubbies, and more. If your students sit in individual desks, simply divide your class into teams. Then, choose one captain per team every week to lead a group in a single activity: paper clean up, putting away electronics, returning books to the correct shelves—whatever you need to get finished by the end of the day. Here are some ways to get kids excited. Make sure you use non-toxic cleaning supplies, especially for the younger set. And remember, you can always slightly water down sprays and use sponges, reusable paper towels, and old-fashioned feather dusters to save money on supplies. Can your students stay focused with music on? Turn on fun age-appropriate music for cleaning time, and bump up the fun factor. Many schools ask families to bring in supplies—unfortunately, those supplies tend to run out in the middle of the year. As we stated before, you don’t have to go out and buy a batch of new cleaning supplies every week. Not only is it a drain on finances, it’s also not great for our environment. Here are a few ways you can save money on cleaning products. Save a bit more money so you can use class funds on the essentials, not on store-bought stuff to clean the essentials. When you’re working with kids, you know it’s important to keep things clear and simple. Use signs, photos, and write cleaning instructions on whiteboards. One 3rd grade teacher thought of a simple yet genius way to give your class cleaning assignments—assign them each a number, and use magnets to move those numbers around by week (or day). Another great thing you can do is create lists that denote responsibilities. For instance, you may tell your students they’re on “table duty,” but will they remember what that means, or will you have to explain requirements every time? When the requirements are posted in an easy-to-see place—say, instructions for cleaning up art supplies and washing paintbrushes near the sink—then kids are less likely to skip a step along the way. They’ll gain confidence and autonomy, and you’ll regain sanity. Take this principle a step further, and include pictures along with words. Do you want to use one bin for wooden blocks, and one for Silly Star Connectors? Take a photo of each, and tape onto the respective box. Is there a certain way kids should put away classroom iPads? Take a photo of how it should look. This will reduce your headaches, guaranteed, and young children will learn to associate pictures and words in everyday life. Teachers all over the US—we salute you for making your classroom a cleaner, more inspiring place to learn and play. Want to learn other tips and tricks for being the best teacher on the block? Follow ECR4Kids on Facebook, Twitter, and Pinterest.